Lifelong friends and Deep North natives, Michigan Rattlers play heavy-hearted Americana folk-rock with an aching dose of Midwestern nice. Graham Young (guitar) and Adam Reed (upright bass) began writing music and performing together in their Northern Michigan high school, and eventually reunited in Los Angeles after a few years apart. Their self-titled debut EP attracted glowing reviews from No Depression, Bluegrass Situation, Relix, Billboard, The Boot and Rolling Stone, which named the band as one of the “Ten New Country Artists You Need To Know” in 2016. After some touring, the band added pianist Christian Wilder to its lineup and recorded Wasting The Meaning, a short EP of cover songs paying tribute to HAIM, Leonard Cohen, and Tom Petty. 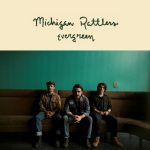 Evergreen, Michigan Rattlers’ debut LP, comes as the band begins a tour across the US. Writing earlier this summer, Rolling Stone described album opener “Just Good Night” as “riveting rock & roll with a country edge” and lead single “Didn’t You Know” as “breezy” and “built around a chorus as rural and lovely as their North Michigan origins.” The LP features twelve original tunes that the trio has honed over years through intense live performance.